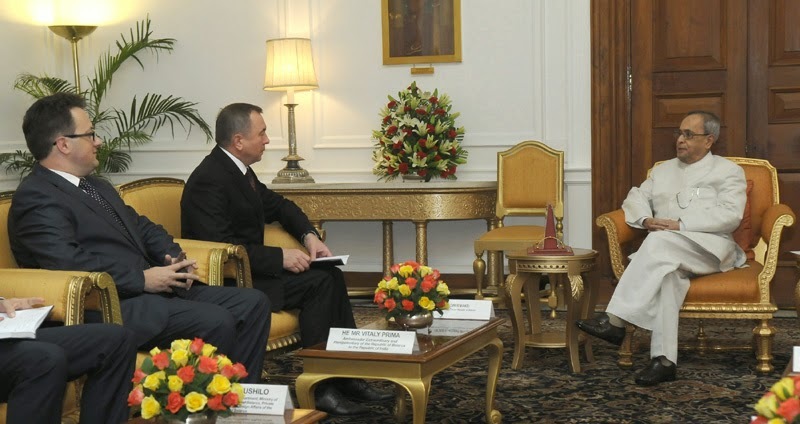 Mr. Vladimir V. Makei, Foreign Minister of Belarus called on President of India, Shri Pranab Mukherjee at Rashtrapati Bhavan yesterday (April 15, 2015). Speaking on the occasion, the President said he is looking forward to visiting Belarus soon and meeting President Alexander G. Lukashenko of Belarus. The President recalled that he had met President Lukashenko as External Affairs Minister during his visit to India in 2007. The two countries share common perceptions on many issues. Bilateral relations are expanding. There is good understanding and cooperation between the two countries on international and regional matters. India appreciates Belarus’s support on India’s candidature for a permanent seat at the UN Security Council. The President said total bilateral trade between India and Belarus is presently at the level of only about US $ 400 million. There is enormous scope to expand and deepen these relations given the potential that exists in both the countries. Belarus is the second largest supplier of potash fertilizer to India and India is a key supplier of pharmaceuticals for Belarus. Import of potash fertilizer is important for India’s food security. There are many more areas where India and Belarus could cooperate more productively. The Foreign Minister of Belarus reciprocated the sentiments of the President and said Belarus sees India as a key partner in the region. Even through Belarus is a small country, it has capabilities in many areas of industry and science. It is possible to make advances in different areas of cooperation. Belarus can contribute to the ‘Make in India’ initiative of the Indian Government and is ready to consider transfer of technology. He expressed confidence that the visit of the Indian President to Belarus would be a major milestone in bilateral relations. The President of India, Shri Pranab Mukherjee will visit Chhattisgarh and Bihar from April 17 to 18, 2015. On April 17, 2015, the President will address the 4th Annual Convocation of Indian Institute of Management (IIM) Raipur at Raipur, Chhattisgarh. On April 18, 2015, the President will inaugurate the Centenary Year Celebrations of Patna High Court at Patna, Bihar. A delegation of Delhi Fire Service led by its Director Shri A.K. Sharma called on the Vice President of India Shri M. Hamid Ansari here today to observe the ‘Delhi Fire Service Week’ and pinned a Flag on the self of the Vice President on the occasion. Fire Service Week is observed all over the country every year starting from 14th April. The Vice President made a token donation for the benevolent fund of Delhi Fire Service which is utilized for group insurance of fire service personnel/welfare/financial assistance to the families of personnel, who have lost their lives/injured during fire-fighting/rescue operations. The Prime Minister, Shri Narendra Modi, has thanked the United States President, Mr Barack Obama, for writing an article on him in TIME magazine. Union Minister of State (Independent Charge) for Development of North-Eastern Region (DoNER), MoS PMO, Personnel, Public Grievances, Pensions, Atomic Energy and Space, Dr Jitendra Singh has said that the Government will develop Mizoram on a fast-track. After an hour-long exclusive meeting with Chief Minister Mizoram, Shri Lalthanhawla at his residence in Aizawl today, Dr Jitendra Singh said, though being one of the smallest and the youngest States of the country, Mizoram has the potential to emerge as a model State of India. During the meeting the two leaders discussed developmental issues as well as the political situation in the State. The Chief Minister explained to the DoNER Minister as to how after 20 years long period of insurgency, Mizoram had limped back to normalcy following the historic accord in 1986. In response, Dr Jitendra Singh assured Shri Lalthanhawla that the Prime Minister Shri Narendra Modi and his government are committed to carry forward the process of growth with peace in this peripheral State and every possible help will be rendered to achieve this objective. Later, before concluding his two-day visit to Mizoram, Dr Jitendra Singh held a meeting with the State administration, which was followed by a get-together hosted for him by State Cabinet Ministers. At the meeting with the administration, which was attended among others by the Chief Secretary and Director General of Police (DGP), Dr Jitendra Singh said that besides working out the feasibility of a direct air-flight from Delhi to Aizawl, he has also offered a middle-route formula for resolving the issue pertaining to the security management of the Aizawl Airport which had become a matter of debate between the State Police and the Airports Authority of India (AAI). In this regard, he suggested to the State DGP to try to work out a working arrangement between the State Police and the AAI. Dr Jitendra Singh also announced that as a part of the new initiative of holding Camp Secretariat of DoNER Ministry by monthly rotation in each of the eight States of Northeast, the next Camp Secretariat in the month of May will be held in Mizoram for which communication is being sent to all the concerned in the administration as well as the MLAs and MPs from the State. This will be an opportunity for the administration as well as the representatives of civil society to directly interact with the officials of DoNER Ministry who will be available in the State, he added. With the literacy rate of nearly 92%, Dr Jitendra Singh said, Mizoram deserves to have a more participatory role intellectually and academically and therefore, in the new Brahmaputra Study Centre in Gauhati University announced by the DoNER Ministry, Mizoram will be accommodated for a suitable slot in exclusive research and higher learning. In today’s meeting on Sugar Industry’s situation, Union Agriculture Minister Shri Radha Mohan Singh emphasized that, the assistance given to the sugar mill should be provided to farmers directly. Shri Radha Mohan Singh also emphasized on encouraging sugar exports and to increase sugar import duty by 40% so that we can stop the imports. National Institute of High Security Animal Diseases (NIHSAD), Bhopal received 10 dead birds from Srinivas Reddy Poultry Farm, village Thorrur, block Hayathnagar in distt. Rangareddy, Telangana on 12-04-2015. On 13-04-2015, Government of Telangana was requested to send a report on the unusual mortality in birds at above farm and to take necessary measures as per Action Plan on Avian Influenza. In the evening of 13.04.2015, Director, NIHSAD informed that five samples were found positive for H5N1 Avian Influenza Virus and that the other samples were under process. In accordance with Action Plan on Preparedness, Control and Containment of Avian Influenza, 2015 edition, intimation of the result was given to the state for immediately starting the control and containment operations at the epicenter so as to prevent further spread of the disease. The intimation was also given to the Ministry of Health & Family Welfare by this Department. The state has informed that there are 18 villages and were about 1, 45,315 birds in one km radius of the epicenter, of which 41040 died till 14.04.2015 and State Government has already started control and containment operation on 14.04.2015 and culled 51,888 birds by 15.04.2015.